The allied aerial offensive against the German synthetic fuel producing facilities from May 1944 is usually seen as the last nail in the coffin of the once mighty German Air Force. This dissertation tries to question this usual perception. It has been attempted to be shown in this paper that for a long time after the offensive against the German oil supply began there was no correlation between the amount of fuel available and the lethality of the Luftwaffe against the allied aircrafts. Moreover, this paper shows that one of the most important reasons for the fall of the Luftwaffe was something very internal to the German economy which was- the over-manufacturing of military aircrafts. The Second World War was revolutionary not only from the tactical or technological point of view but also from the resource management point of view. After all, this was a war where the most developed and industrialized countries of the time used up to almost half to three-fifth of their total national incomes in the war efforts. It is this resource management that this paper is going to address. This paper will in a very small way try to show the importance that resources, its possession and usage should receive when a country is moving towards large scale military hardware acquisition, using the context of the Second World War. The country in focus will be Germany during the Second World War and the military wing mostly covered in this paper will be the German Air Force or the Luftwaffe. The resource that this paper will mostly be concentrating on is fuel and the role it played in hastening or delaying the outcome of the war. This focus on the German fuel supply and Luftwaffe will be mostly from the point of view of the allied aerial bombardments on the German synthetic fuel producing facilities in 1944.This increased importance on the Luftwaffe will be given because of the logic affixed by the Allied commanders to the bombing of the fuel facilities of Germany, that it was expected to result in fewer pilots and aircrafts intercepting allied missions over axis territories. The attack on oil started from May 1944, with 10 air raids by the United States Army Air Force (USAAF), in the next month the Royal Air Force (RAF) also joined in. These air raids reached its climax by December of 1944, in terms of the number of air raids undertaken on these sites. By then, the allies had managed to reduce the total production of petroleum products of the Germans to just over 250,000 metric tons per month from over 600,000 metric tons in May 1944. One of the primary purposes why they started this bombing is to knock out the Luftwaffe from the skies and to make the allied Invasion of France successful or at least free from the interference of the Luftwaffe. This plan seems to have worked too because by September 1944 the Luftwaffe was more or less considered to have been overrun by the allied air power. To a very large part this was seen as the contribution of the aerial offensive against oil, and to a large extent it is still seen that way. This paper will attempt to put forward two theses. The first one being that, as far as the Luftwaffe was concerned, the drop in their level of efficiency in exhibiting their lethality against the allied aircrafts, in 1944, was not due to the lack of availability of aviation fuel, at least till August, which is 4 months after the massive bombing on the German synthetic fuel facilities started, and this date is also well beyond the date of the successful allied landings in Normandy. The second thesis emerges from the first one, which is that, one of the primary reasons for the drop in the performance of the Luftwaffe was that they were in possession of too many aircrafts. In a wider perspective this paper is a small attempts to show that expansion of the military wing of a country without any pre-set goals or calculations or forecast of how much forces are required to protect a particular space and how much forces can the country afford to properly supply with resources they have or plan to have, can be highly derogatory for a country’s defensive capabilities. 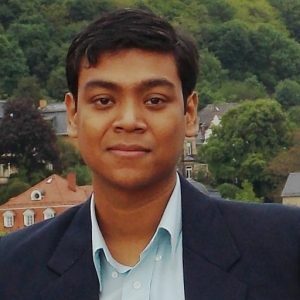 This dissertation should in its own small way show that while planning the military strategies of a country be it for war or peace it is very important that we keep in mind three things, the area that is required to be defended, the resources that are available and how much military hardware and software can those resources support properly. With little exception, most of the literature since the war years has been quite convinced about the very serious impact that the allied attack on the German oil supply had on the performance of the Luftwaffe. Long time commander in chief of the Luftwaffe Herman Goering, commander of the Luftwaffe’s fighter wing Adolf Galland and the Nazi Armament minister Albert Speer believed that the allied attack on oil was a decisive factor in the final downfall of the Luftwaffe. Several commanders and war planners on the allied side were also convinced about the need and later the effectiveness of the allied air attack against the German synthetic fuel plants. The USSBS (United States Strategic Bombing Survey) is quite optimistic about the effects that the bombings had on reducing the fighting capacity of the Germans, it also indicates that the bombing campaigns against oil had the most decisive impacts around the time of the D-Day landing in 1944. It is only amongst the people like the American economist W.W. Rostow (who during WW II, served in the OSS in Europe) and British economic historian Alan Milward who even though they agree, on the important role of these aerial raids, try to caution us against laying too much importance on them. As far as the issue of manufacturing is concerned there is some debate on the performance and position of the German military in the first few years of the war. Historians like Overy and Müller encouraged by the accounts of Wagenführ and Eichholtz stress on the almost sudden increase of efficiency of the German military hardware producing industry after Albert Speer was made the Armament minister. While others like Scherner, Streb and Budrass try to show us a more continuous growth of the German military hardware industry. But there is little doubt that in the last full year of conflict, that this thesis is mostly concerned with, saw the highest production rate of things like aircrafts and armoured vehicles. Regarding the relationship between increased quantities leading to reduced quality, Goering accepts that this most probably did happen. But this issue is most aptly expressed by Adolf Galland when one of his interrogators after the war asked him if he would prefer more, less trained pilots or numerically inferior well trained ones. Galland answered that he will always go for the second option and compared the first one with putting a horse acrobat on an old horse. This introduction will be followed by four other sections. The first one will be illustrating the downward trend regarding the performance of the Luftwaffe and how the fuel available to the Luftwaffe was seldom having any effects over its performance. The next section explains the most probable reasons related to the Nazi oil supply, regarding the reduction in the performance of the Luftwaffe. The third section will try to link the reduction in efficiency of the Luftwaffe to the aircraft manufacturing industry of Germany. The final section in this paper is the conclusion. In this section there will be an attempt to examine the claims made by several people (Spaatz, Galland, etc.) both during the war and after it that the availability of fuel and the performance of the Luftwaffe were interrelated. Before we proceed with examples and explanations in this section it should be kept in mind that, synthetic fuel comprised of over 90% of the aviation fuel of the Germans, and that it was the chemical plants producing these fuels that were the hardest hit in the allied attack against the German oil supply. From just around 200 tons of bombs falling from January till April 1944 to almost 14,000 tons of bombs in average (per month) falling from May 1944 till December 1944, on the synthetic fuel plants, there could be no doubt that the allied bombing campaigns effected the Nazi oil production to a very large extent. These attacks in some places reduced the production of oil to something which was quite insignificant. Immediately after the beginning of the offensive against oil there was a very significant impact on the German oil production, but at the same time it fails to make a dent in the German fuel consumption which remains quite substantial for the next 3 to 4 months. How they could keep on consuming substantially more amounts of fuels than they were producing could be perhaps answered by the 107,000 metric tons of aviation fuel imported by the Germans in 1944, by the increase in the fuel reserves from 33,786 tons in November 1943 to 119,738 tons in May 1944, the 102,000 tons of fuel produced from January 1944 till April 1944, which exceeded the consumption amounts, and finally the unexpectedly high stocks of aviation fuel which was captured in Italy at the end of 1943. How the Nazis managed to get the extra aviation fuel is not within the orbit of this paper but, what is, is that the Germans did possess a lot of aviation fuel till at least August 1944. But, after August, as the reserves started to deplete, the production and consumption started to show much better correlation than before (see figure 1). But surprisingly, there seems to be almost no correlation between production or consumption levels of aviation fuel with the performance or lethality of the Luftwaffe. Thus, as far as the effectiveness of the Luftwaffe goes in shooting down enemy planes over the skies of the Reich and its occupied territories, it is quite certain that it was seldom or never related with the fuel that was available for it to consume, at least as far as the year 1944 is concerned. Figure 1. Data from the year 1944. Fuel mentioned in 1000 metric tons. 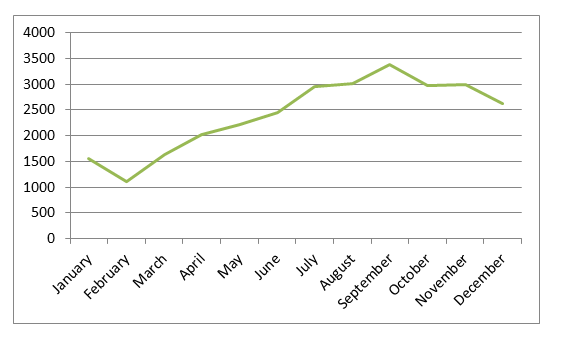 Despite the immense aerial bombardment by the allied air forces on the synthetic fuel plants the average percentage of aviation fuel production capacity from August 1944 till December 1944 was 50.6%. But if we calculate the average of the percentage of the sortie loss rate of the Eighth Air Force of the United States Army Air Force (USAAF) in these months, it is 1.64% but if we calculate the last five months from October 1943 till February 1944, the months before the campaign on oil was taken up by the allied forces and before the fall from the peak oil production took place, the average comes up to be 4.8% (see table 1). Thus what we see here is that even though the aviation fuel production capacity has been decreased by around 50% the effective fighting capability of the Luftwaffe has been reduced to even larger extent, to almost a third of the previous period. This doubt expressed regarding the specific correlation (between the fuel and performance) that we are dealing with in this chapter, deepens when one considers the fact that the Germans were consuming quite a substantial amount of fuel till at least August 1944 and looks at its consequences. Here, it is important to put the month of August in context because it means that the Luftwaffe got another extra four months to inflict damage on the allied air forces and discourage them from attacking the oil supplies. Now let us look at another example. 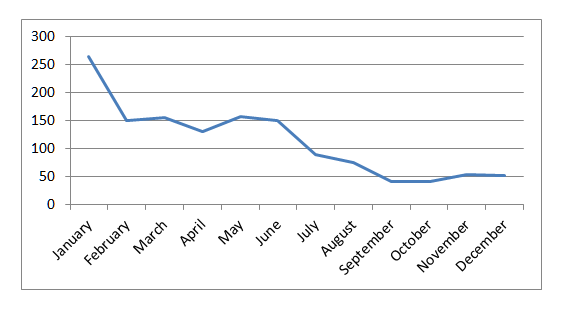 This example considers the average percentage of losses that were incurred by the RAF aircrafts while carrying out night raids in the last 3 months where the production exceeded the consumption of aviation fuel i.e. from February till April 1944 and the first three months where the consumption exceeded the production i.e. from May till July 1944 (see figure 1). It will also be worthwhile keeping in mind that the within these three months consumption had exceeded production, by a very big margin. The consumption in July 1944, was at least a 1000 tons more than February 1944 (the first month under consideration for this comparison). The average percentage of losses that were inflicted on the RAF aircrafts by Luftwaffe fighters from February 1944 till April 1944 is 1.2% of the air fleet while in the same year by consuming almost 58,000 tons of more aviation fuel the average from the months of May till July 1944 is 0.9%. A similar trend was seen when we examined the casualty tables of the US 8th Army Air Force, too. This point can even be further stressed when one considers the fact that from the months of May till July the Luftwaffe not only had more aircrafts but it also had more operationally ready crew members. Thus it seems to be very evident that the Germans had failed to positively correlate the increase in aircraft production and deployment to increase in the casualty on the allied side. But most importantly, in contrast to the previous example, which was considered under the circumstances of gradually reducing fuel availability this example shows that even when the Luftwaffe was consuming more fuel its performance did not improve, instead it deteriorated. The inefficiency of the Luftwaffe could be further shown by using the following figures (figures 2 and 3). What we see when we compare these figures is that the amount of bombs being dropped and number of aircrafts being deployed by the RAF correlate to each other. We also see that the German high command was responding to the threat by increasing the production of fighter aircrafts, thus the rate of production of the fighter aircrafts by the Germans also correlates to the bombs being dropped and the number of aircrafts being deployed by the RAF. In fact the Germans in 1944 were in possession of a larger air fleet than ever before in the war. But there seems to be no correlation between the figure showing the number of RAF aircrafts being shot down (figure 1) and the other two figures (figures 2 and 3). Most importantly and probably most worryingly there seems to be no relation between the number of fighters being produced and the number of aircrafts those fighters manage to shoot down. 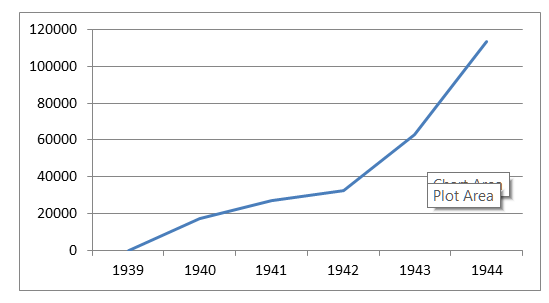 Figure 2: Graph regarding the data of 1944 (Tonnage in 1000 metric tons). Figure 3: German Fighter Aircraft Production in 1944. By the end of this section, the undoubtedly important facts that we have come across and which will have to be considered as we discuss this topic further in this paper are that the Germans somehow had a lot of fuel, used it to a very large extent and that they were also in possession of the largest air fleet till then. But the question regarding why even after all this the German air force could neither inflict heavy losses on the allied air force nor could they make any impact on the constantly increasing bomb loads being dropped on Germany remains. An attempt to answer these questions will be made in this paper later but for the time being, there are two clear points in front of us. Firstly, what we are seeing here is that before the allies had bombed out the synthetic fuel facilities beyond repair the German Luftwaffe did get their own “fair” chance of around 4 months to react to the threat. Secondly, we see the reducing efficiency of the Luftwaffe from the point of view of production and lethality- in other words, despite having the biggest air force in the entire war the German Air Force in 1944 was no longer a major force to be reckoned with because of the severe fall in the rate of shooting down enemy aircrafts. As has been seen in the previous section, that even after the bombing on German synthetic fuel producing facilities had started the chief effect which was expected to be seen on the Luftwaffe, namely keeping it on the ground was not realized for at least another 4 months. But then on the other hand it was also shown that whether the Luftwaffe was consuming more or less fuel did not matter as the efficiency of the Luftwaffe was constantly decreasing in 1944. Some of the reasons for this lack of efficiency related with resources, in particular to fuel, has been attempted to be explained in this section. For this purpose it has been divided into two parts, the first part deals with the training related reasons and the second part deals with the reasons relating to the Nazi high command’s failure to prioritize their objectives. The reason from the viewpoint of the training of pilots, which relates with the decrease in the effectiveness in the Luftwaffe, was the decision to put substantially less trained pilots than before, in the frontline. This shows signs of complete non- consideration of the fact that the Germans were facing a resources crunch. Here “less” refers to the reduced flying hours required for the pilot to be considered trained. It is the same story when we look at the qualitative side, which is that the quality of training was decreasing as well. The trainers of the pilot training schools were reduced as they needed more experienced pilots in the frontlines and at the same time the Germans were recruiting more pilots because their losses were sky rocketing (look at figure 4). It almost resembled a vicious circle. The total flying hours of the German trainee pilots from July 1944 was less than it had ever been since the beginning of the war. Now the question to ask here is that, was putting a large number of less trained pilots in the frontline, which was what the Germans did from July 1944, a rational reaction when they were having a very serious problem in not only producing aviation fuel but also problems in making the raw materials reach their destination? A rational answer to this question should be – “no”. This method was not only a drain on one bottle neck industry which is fuel (as lowly trained pilots were going to use it) but also the industries which were not bottleneck industries before but once the allied air campaign on the German transportation system started these became bottleneck industries. One such industry was the German iron and steel industry. The German iron and steel production was naturally very important for the aircraft industry but it was very much dependent on the coal supply which it gets. One such disruption of this coal supply, due to transportation problems, took place in the winter of 1939-40, which caused a massive disruption in the German war economy and even played a major role influencing Hitler’s decision to postpone the invasion of France. But an even bigger disruption was going to come in 1944 due to transportation, when a very heavy allied aerial campaign against it was undertaken by the allies. This difficulty in transportation can be very well be seen in Albert Speer’s letters to Hitler in Summer/Autumn 1944, regarding the bombardment of the synthetic fuel plants, in which he writes about the difficulty in transporting coal. We have to realize here that coal was not only needed for the iron and steel industry to function properly but it is also the basic raw material from which the synthetic fuel was produced. Moreover, this action of the Nazi High Command to send less trained pilots to the frontlines was also a massive liability on the already low stock of human resource left for the Germans to use. Figure 4: Amount of fuel to be consumed (in tons) by the Luftwaffe to lose an aircraft in 1944.
performance of the Luftwaffe pilots per ton of aviation fuel used, in order to find out the amount of aviation fuel that has to be consumed by the Luftwaffe to lose an aircraft. The clear facts or patterns that we can manage to get from the above figure (4) is that the Luftwaffe was facing terrible losses specially starting from July 1944.This date of July 1944 is also important from the point of view that it was when the training hours of the German pilots were the most reduced. The downward trend of figure 4 is very similar to the downward trend of figure 5, thus showing that there must have been a major link between the failing health of the Luftwaffe and the training that their pilots were receiving. 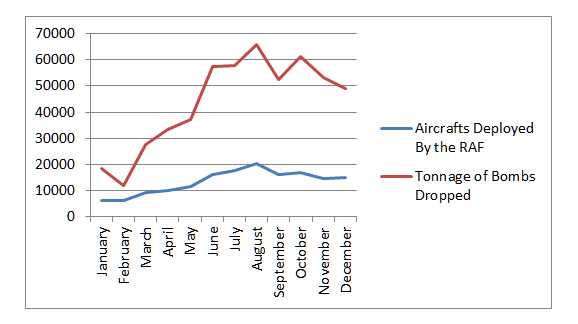 From July 1944 the Luftwaffe was losing an aircraft approximately, per 90 tons of aviation fuel that it was using, but it was a massive drop from the previous month in which the amount of fuel required to lose an aircraft was 150 tons. 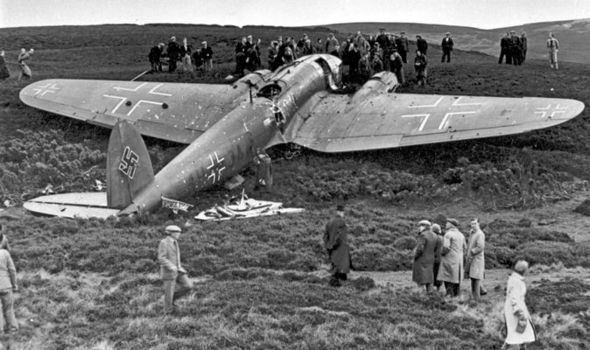 How bad the situation was can be judged by the fact that in 1944 every 66 tons of aviation fuel that the Germans used they lost 1 pilot and every 47 tons of aviation fuel used, they ended up either injuring or losing a pilot. The magnitude of the losses that the Luftwaffe faced in 1944 could be better understood when we realize that the total number of pilots killed or missing in 1944 was 21,059 and the total number of pilots lost by the Luftwaffe from the beginning of the war till December 1943 was 48,564. The Germans had produced in 1944 almost 15,000 more aircrafts than in 1943 and around 17,000 more fighter aircrafts were produced in 1944 than in the previous year. But, the number of RAF aircrafts shot down by the German fighter aircrafts in 1943 was 964 while in 1944 it was only 940. Even though there may not be much difference between “964” and “940” aircrafts, the reason for putting “only” is that in 1944 the Germans were in possession of a much larger force than in the year 1943. Now if we consider figure 5, and then consider the fact that the average percentage of the sortie loss rate of the bombers that the USAAF’s 8th Air Force had to endure was 5.1% in 1943 and 1.9% in 1944, we will see similarities between the patterns to the losses endured by the RAF and USAAF. The pattern which arises here is one which involves reduction in the training period with simultaneous reduction in the allied planes being shot down, and this is in the sight of the fact that the Germans were in possession of more fighter aircrafts in 1944 than in 1943. This correlation can be found to be very strong in July 1944, in another way. As shown in figure 5, the German trainee pilots started to receive the least amount of flying time during the training period from July 1944. Now if we compare this to the aircrafts shot down by the Luftwaffe in the month of July and the previous few months, it is only in the month of July that the total score of the German fighter pilots were less than 100 RAF aircrafts, a sudden drop from its previous two months when it was 137 and 128 (in May and June respectively). Figure 5 Flying hours in German Pilot Training. The second reason for the lack in the efficiency of the Luftwaffe will be discussed in this section. This reason can be said to be the failure of the German high command to decide what to defend and what not to defend. The different ways in which this problem plagued the German war planners in 1944 will be highlighted in this section. By 1944, the German military had come a long way since the revolutionary military techniques which won them great land victories in the beginning of the war. Hitler used to see himself as the proponent of the new ways of fighting a war and he truly was a major advocate of the new tactical ways of fighting. But as the war dragged on into 1944, this dictator of Germany became very conservative in his outlook towards the military tactics and strategies that can be followed. By 1944 Hitler seems to have become obsessed with the idea of defending every inch of land that had been conquered. The degree of destructiveness to which this obsession of Hitler went can be found in the development of the “feste platz” or fortified areas tactic in the Eastern Front, which was basically to fortify a city/area to the maximum extent possible and then to defend it. On the Western front this obsession of Hitler of defending everything conquered before, can be seen in the building of the Atlantic Wall along the coast of Northern France, which had uncanny resemblance with the Maginot Line of the French in not only its perceived function and design but also in its monumental failure. These tactics and strategies that were followed bear very striking resemblance to the strategies and tactics of a previous era of warfare in a period when Hitler fought his battles on the ground- the First World War, but definitely not the second. These kind of orders in the Second World War was not only counterproductive as shown by the total failure of the “Atlantic Wall” in the Western Front and the “feste platz” system in the Eastern Front but also created major logistical and economic problems with regards to the distribution of the resources, especially when these resources were scarce (e.g. fuel) and the distribution mechanism has been hampered (e.g. by allied air attacks on the German transportation system). Under the circumstances as described in the above paragraph there should have been proper deliberation on the priorities of the German Air Force. This sort of a realization was seen in the allied (especially American) air war campaign when it was realized that the German economy was just too big to go on targeting everything and expect feasible results. Thus a strategic bombing campaign against the German industry aimed at specific sectors was carefully planned from 1944 after the numerous reverses that the allied air war campaign faced till 1943. It was this phase of concentrated of allied bombings which is considered by most people to be decisively successful. On the other hand the German high command, seemed to have had never realized that the allied air force and the industrial strength behind it were just too big to knock out all the enemy planes off the skies. Germans seems to be determined not to prioritize but to try to defend the air and land wherever the danger of them losing it arose. One of the greatest examples of the “non- prioritizing” way in which the German air force was used can be seen as one goes through the report sent by Albert Speer to Hitler on the 28th of July 1944 regarding the situation of the fuel supply. This letter was sent 2 months after the attack on the oil had already started. In this letter, Albert Speer expresses his shock that the fighter protection that was required by Germany at an increasing number not only to protect different industries but most of all to protect their fuel supply had not increased; in fact it was reduced since the time the bombing on oil started. What is further reflected very clearly in Speer’s report is that there should be a significant relocation in the deployment of the German fighters/interceptors to the protection of the industries in the Reich because the deployment in the fronts are anyway not being able to meet the requirements for aerial superiority and will not be able to achieve that goal in the future if the fuel production of Germany was interrupted in the same way as it was being done till then. This lack of prioritizing is quite evident in table 2. Table 2: Deployment of German fighter aircrafts in the June 1944 . There was severe increase in the number of allied aircrafts attacking the German forces or specifically coming into conflict/combat with the Luftwaffe (Check figure 6), in 1944. The very simple question which can be asked after looking at that figure is that whether the reduced efficiency in the part of the Luftwaffe was due to the significant increase of enemy aircrafts. This question will be attempted to be answered in the next two paragraphs. To answer this, one need to ask the question -did the opening up of the second front which out of so many things that it affected, also impacted the Luftwaffe by splitting its priorities in the Western front? Once the Normandy landings took place in June 1944, the German air force in the West not only had to focus on a primarily interceptor capacity against the allied bombing raids but also in the capacity of supporting the troops on the ground. The German high command clearly had a choice between deciding whether they would like to defend the German industries in Gross Deutschland or they wanted to maintain the support of the troops on the ground. By looking at table 2 above we can basically say that they had decided to go for both options, with a little bit more importance been given to troop support in the Western and Eastern Front. How effective was the Luftwaffe in the Western front after the D-Day landings? After the D-Day landing the German troops on the ground constantly complained about the almost complete absence of their air force and the negligible extent to which they were being protected from the air. Thus, the subsequent questions would be firstly, what do we see the Germans achieving by diverting their air force into playing increased number of roles and secondly, whether the German Air Force would have been able to react to the allied bombing raids in a decisive manner if they could have mostly concentrated on protecting their industry in their fatherland. 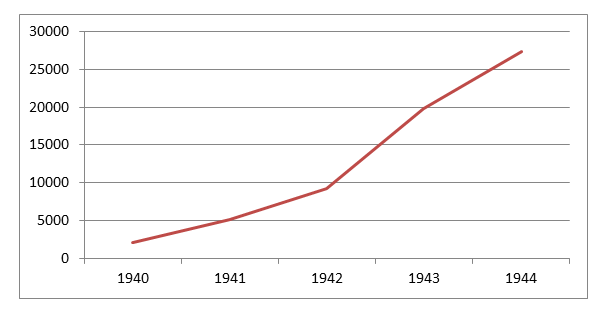 With regards to the first question, the Germans by increasing the pressure on the air force seem to have decreased the efficiency of their air force to an all-time low, in the sense that they were shooting down less allied aircrafts, more bombs were falling on German occupied Europe and specifically on the Western part from the air than ever before despite the Germans being in possession of more aircrafts than any-time before in the war. 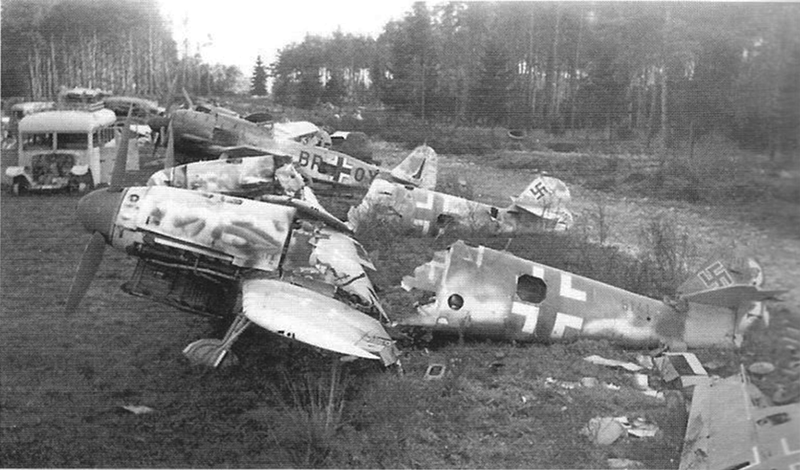 Luftwaffe was also losing more pilots not only in per ton of aviation fuel used but also in total number of pilots lost. Thus there seems to be no positive answer to the first question. But then with regards to the second question it involves a lot of speculation which also involves a lot of uncertain variables and modeling of a situation that did not take place at all. Thus, the best answer to the second question at the moment will be that we do not know the answer to that question. This also means that the question regarding whether it was the large number of aircrafts involved in the bombing raids against the Germans reason for the deterioration in the efficiency of the Luftwaffe cannot be sufficiently answered at the moment because the Luftwaffe challenge that these aircrafts faced was not a Luftwaffe designed to challenge them in the West, as it used to happen before the Normandy landings but a Luftwaffe which was so enormously multi- tasked, that only a part of it was responsible for meeting their challenge. Probably one of the best examples of how the deterioration in the training of the Luftwaffe pilots and the defend everything mentality of the Nazi High Command were effecting its performance can be seen in the immediate aftermath of the Normandy landings. It was in the months of June and July 1944 when the Luftwaffe moved a large number of its aircrafts to the Western theatre of the war. This transfer was to be made in total secrecy so a decision was made to ask the pilots to fly at a low altitude to evade the allied radar and to maintain radio silence. Along with this the infrastructure of the French air bases was not as good as the ones in Germany and for many of the pilots the aspect of familiarity with the terrain was completely missing. In the months of June and July the number of losses of aircrafts that the Luftwaffe had to incur was around 1500 aircrafts each month. They neither experienced these kinds of losses before or after that. Losing hundreds of comrades in arms in the sight of overwhelming numerical superiority of the enemy was very demoralizing for the Luftwaffe. Also several pilots previously on duty in the Eastern front or in the defense of the Reich were put into new groups and sent to the Western front, thus adding to the already confusing situation. This confusion was worse for the fighter pilots who were constantly divided and asked to perform various duties quite frequently. Thus in conclusion, in this section, it has been shown that the two main reasons for the reduction in the performance of the Luftwaffe were the reduction of the quality and quantity of training of the Luftwaffe pilots and the “defend every inch” mentality of the German high command which eventually led to the non-prioritization of the objectives for the Luftwaffe, and as a consequence reduced its efficiency. The main aim of this section will be to deal with the issues regarding the manufacturing of the military hardware by the Germans especially in 1944. At different places in this paper there has been the mention of the manufacturing trends of the German military hardware manufacturing industries. Here this manufacturing sector will be brought into perspective and its possible relations with strategy, training, resources and performance of the German Air Force will be examined. For this purpose this section has been divided into two parts. The first part deals mainly with the relationship between manufacturing, resources and strategy and the second part deals mainly with the relationship between training and manufacturing. To put things in clear perspective it is important to first have a look at the following figures – 7, 8 and 9. Figure 7. Military Aircraft Production by the Germans, 1939-44. Figure 8. Fighter aircraft production by the Germans, 1939-44. Figure 9: Total Production of German Armored Fighting Vehicles. What we get from the above three figures is a pattern which shows that despite the allied attempts of aerial bombardment on the German military hardware producing sector, they do not seem to have succeeded in reducing their output in the final full year of the conflict, in comparison to the previous years. It is quite clear from the above graphs that in 1944 the Germans were producing more planes and tanks than they had ever done before. But the circumstances under which this production was taking place can be best illustrated by the following figure. The military hardware that we spoke about in the three previous figures (7, 8 and 9) needed the fuel mentioned in figure 10 to be of any use. Figure 10: Fuel available with the Germans (in metric tons). manufacturing. This over manufacturing had serious consequences on many of the important industries for the German war efforts, especially with the serious strategic bombing of the German industries being carried out by the allied air forces in 1944. How seriously the over production impacted the German economy towards the end of the war can be properly perceived when we consider the difficulties faced by several German industries in acquiring the iron and steel quota that they were entitled to. The Germans were always in possession of more iron and steel than the Soviet Union was all throughout the war, and despite this in the Eastern Front the Soviet Union grossly outnumbered the German troops and weapons. Thus the question to ask here is where did all that iron disappear? Even though a complete answer to the question is not possible here, it can be answered very simply by looking from the perspective that the iron which was not provided to one sector was naturally diverted to another sector, which keeping in mind the high levels of military hardware manufacturing, would in more than often occasions, be sent to the military hardware producing industries. Thus, the Germans seem to have grossly mismanaged their available resources by producing ever increasing numbers of military hardware in a time when they had far lesser territory to defend, less fuel to properly furnish the hardware with and this while facing a resource crunch which made it impossible for them to provide enough quantities of resources or raw materials to all industries. By virtue of the above figure (12) we can establish the relationship between this section and the previous one. First of all we have seen that as the year 1944 comes to a close the amount of fuel available for the Luftwaffe to consume was decreasing rapidly, but then the combat readiness of the Luftwaffe aircrafts do not show this reduction in fuel production at all, instead the combat ready formations have increased in the German Air Force as the year 1944 comes to an end. It is also worth considering here that the loss rate of the Luftwaffe severely started to increase once the amount of training had also decreased from the month of July. It is quite clear that a very high combat readiness was maintained by the Luftwaffe by virtue of the high performance of its aircraft industry and by the reduction of the time required for the training of the pilots. But as the 2 figures (1 and 13) shows, that the increase in combat readiness have no impact in improving Luftwaffe’s lethality in year 1944. Figure 13: Combat Readiness of German Aircraft from 1942 till 1944. Table 3: Trends of the German aircraft manufacturing industry from 1942-44.
for a trainee pilots got reduced below 200 hours it was following at least a few months of severe increase in the number of aircrafts being produced and the same trend can be seen in the year 1944. 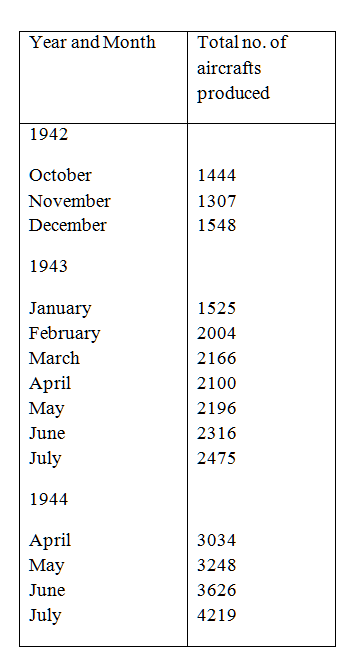 In 1943 the training time got reduced when after months of producing not more than around 1500 aircrafts per month from the end of 1942 till the month of January 1943, the Germans started to produce more than 2100 planes from the month of March 1943 (Check table 3). Again this reduction in the training period can be seen when in 1944 the training hours of the Luftwaffe pilots were reduced when the production of aircrafts per month had exceeded the mark of 3000 for three months continuously for the first time (in April, May and June), in fact in the month of July 1944, which is the month beginning from which the training hours of the Luftwaffe pilots had become the lowest in the entire war period, the Germans for the first time managed to produce 4000 aircrafts in a month. Thus this provides a very strong correlation which cannot be denied. 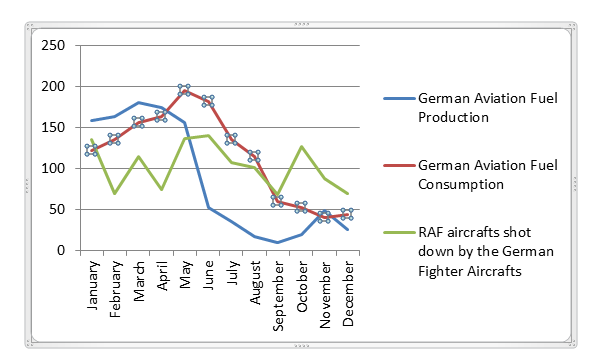 This correlation which always seems to start with the increase in production of aircrafts and then followed by the reduction in the training hours of the Luftwaffe pilots quite evidently shows that the increasing number of aircrafts were creating an increased pressure/demand for more trained pilots and one of the ways of meeting this demand was by reducing the amount of training hours of the pilots and the results of which can be seen in the reduced performance/efficiency of the Luftwaffe. Thus it was the high performing aircraft manufacturing industry itself which was pushing down the quantity and quality of the training of the Luftwaffe pilots and so, has to be considered a major factor in the reduced effectiveness of the Luftwaffe against the allied aircrafts. Thus in conclusion, in this section it has been shown that the production of record number of military hardware by the Germans, which took place in the final full year of the conflict that is in 1944, was extremely harmful to the German war efforts. From a strategic point of view it is highly doubtful whether they needed that amount of weapons in 1944 due to the reduction in the size of the frontline and lack of not only human resources but also of the lack of fuel. From the resource management point of view the Germans seem to have got engaged in over manufacturing the military hardware thus creating difficulties in the acquisition of resources for the other German industries. Finally, this trend of over manufacturing the military hardware at least as far as the Luftwaffe is concerned, seems to have had a direct effect on reducing the training period of the Luftwaffe pilots and thus reducing their efficiency. This dissertation had accepted the challenge of proving two theses in the introduction. The first being that till September 1944, the Luftwaffe did not face a very serious aviation fuel crunch and that the lack of efficiency of the Luftwaffe in 1944, at least till August, was not linked to the availability of fuel. The second proposed hypothesis was that one of the reasons for the poor performance of the Luftwaffe mentioned in the first thesis was related to the Germans over manufacturing their aircrafts. The first hypothesis was mostly proven by establishing very strongly in the second section that in 1944, whether the Luftwaffe was consuming more or less fuel, it was not correlating with its performance in the air. It is very clear from especially figure 1, that the production or the consumption of aviation fuel simply did not have any correlation with the number of enemy planes the Luftwaffe was shooting down. Also a very important objective, of the allied offensive against German oil supply, which was to keep the Luftwaffe stuck to the ground, due to lack of fuel was not achieved till September 1944 (5 months after the operations started) as even in August the Luftwaffe was consuming quite substantial amounts of fuel. The second hypothesis was proved by basically using a two-step method. Firstly in the third section it was shown that there is a very strong correlation between the reducing efficiency of the Luftwaffe in exhibiting its lethality against enemy aircrafts and the reducing quantity (in terms of flying hours) and quality of training the Luftwaffe pilots. In the second step it was shown in the fourth chapter that there was always a sharp increase in the production of the number of German aircrafts before the training of the Luftwaffe pilots start to deteriorate. Thus, if we try to summarize both the theses we get the following sequence. First there is over manufacturing of aircrafts which then puts pressure for more pilots, this pressure is met by reducing the training quantity and quality of the pilots and thus leading to low performance. It is this low performing nature of the Luftwaffe which played an important role in making the allied bid for aerial superiority successful, despite the Germans being in possession of a bigger air force (than before) and quite substantial amounts of aviation fuel. The Germans had enough fuel for 4 more months since the allied offensive against the German oil supply began. They also had enough fuel when the Normandy landings took place and even when the allied offensive for the breakout from Normandy happened. It is desired on the part of the author of this paper that the aspects of this paper which could not be covered because of the limited scope of this paper will be covered by future research in this field. There needs to be further similar research in the bottleneck industries other than the fuel industry and include not only the air force but also other military wings and the civilian sector as well. More specifically with relation to this paper, there should be further research into the question of why there is a decline in the fuel production of Germany from March 1944 onwards when there were no bombs dropped. Moreover, as has been shown in the third chapter that one of the major reasons for the decrease in the lethal efficiency of the Luftwaffe was because their Nazi planners failed to prioritize their objectives, properly, a model should be made which shows the results of what would have happened if the Germans dedicated more aircrafts to the defense of the Reich rather than sending them to the frontlines, especially once the attack on oil started. Such research will present to us a more comprehensive macroeconomic picture of the events during a severe crisis period. Harrison, The Economics of World War II, p. 21. USSBS, Oil Division, Final Report, figure 16. Boog, Strategischer Luftkrieg in Europa , pp. 113-115. Overy, The Air War -1939-1945, pp. 78-81. Galland, The First and the Last, p. 279. See Webster and Frankland, Strategic Air Offensive, pp. 385-386; Galland, The First and the Last, p. 279; USSBS, Interview with Herman Goering, pp. 4-5. Boog, Strategischer Luftkrieg in Europa , pp. 113-133. See Milward, The German economy at war, pp. 162-189; Rostow, Pre-Invasion Bombing Strategy, p. 86. Overy, War and Economy, pp 288-290; Müller, Albert Speer und Rüstungspolitik im Totalen Krieg, pp. 545-618. See, Budrass, Scherner and Streb, Fixed Price Contracts, Learning, and Outsourcing, pp. 107-136; Scherner and Streb, Das Ende eines Mythos? Albert Speer und das so genannte Rüstungswunder, pp. 172-196; Scherner, Nazi Germany’s Preparation for War, pp. 437, 447. USSBS, Interview with Herman Goering, p. 3. USSBS, Interview with Adolf Galland, p. 7. BIOS, Report on the Petroleum and Synthetic Oil Industry in Germany, pp. 1-3; Webster and Frankland, The Strategic Air Offensive, pp. 382, 386. USSBS, Oil Division, figure 16; USSBS,The Effects of Strategic Bombing, pp. 4-5. See, Webster and Frankland, The Strategic Air Offensive, pp. 431-439; Birkenfeld, Der Synthetische Triebstoff, pp. 224-5. Birkenfeld, Der Synthetische Triebstoff, pp. 224-5; Webster and Frankland, The Strategic Air Offensive, pp. 431-439. Müller, Albert Speer und Rüstungspolitik im Totalen Krieg, pp. 594-5. Ibid, pp. 594-5, 656, 658-659. Webster and Frankland, The Strategic Air Offensive, pp. 433, 436, 456. Müller, Rüstungspolitik im Totalen Krieg, pp. 594-5, 656, 658-659. Webster and Frankland, The Strategic Air Offensive, pp. 456-7. Overy, The Air War -1939-1945, p. 78. USSBS, Overall Report, pp. 21. Milward, The German Economy at War, pp. 162-189. USSBS, Interview with General Galland, p. 6. USSBS, Effects of Strategic Bombing, pp. 96-99, 108. See BIOS, Iron and Steel Works in Germany ; Müller, Rüstungspolitik im Totalen Krieg, p. 424. Tooze, Wages of Destruction, pp. 342-347. USSBS, Effects of Strategic Bombing, pp. 4-6. Webster, and Frankland, The Strategic Air Offensive, p. 335. Birkenfeld, Der Synthetische Triebstoff, p. 143. Bekker, The Luftwaffe War Diaries, p. 380. Overy, Why the Allies Won? pp.331-332. Webster, and Frankland, The Strategic Air Offensive, pp. 431-439. Webster, and Frankland, The Strategic Air Offensive, p. 433. USSBS, Overall Report, p. 21. Adair, Hitler’s Greatest Defeat, p.181. See, Vogel, Deutsche und Alliierte Kriegführung im Westen, pp. 465-471, 536-550; Churchill, Their Finest Hour, pp. 43-44. Webster and Frankland, The Strategic Air Offensive, p. 379. Boog, Strategischer Luftkrieg in Europa, pp. 112-133. For example see, Webster and Frankland, The Strategic Air Offensive, pp. 293-297, 378-383. Webster, and Frankland, The Strategic Air Offensive, p. 437. Vogel, Deutsche und Alliierte Kriegführung im Westen, p.552. See Webster and Frankland, Strategic Air Offensive, pp. 431-439; USSBS, Statistical Appendix, p. 10; Müller, Rüstungspolitik im Totalen Krieg, pp. 594-595, 658-659 and refer to figure 4 above. Müller, Rüstungspolitik im Totalen Krieg, pp.658-659. See, Galland, First and the Last, ch. 32 or USSBS, Interview of Herman Goering, p. 8. USSBS, Overall Report p. 12. Overy,Why the Allies Won, p.332. Müller, Rüstungspolitik im Totalen Krieg, pp. 554-555. USSBS, The Effects of Strategic Bombing, pp. 164-166. Webster, and Frankland, Strategic Air Offensive, p. 511. See for example, BIOS, The German War Time Electricity Supply, p.2. Müller, Rüstungspolitik im Totalen Krieg, pp. 517-518; Harrison and Barber,The Soviet Home Front, p. 189; Adair, Hitler’s Greatest Defeat, pp. 85-86. Webster, and Frankland, Strategic Air Offensive, pp. 387-389. Webster, and Frankland, Strategic Air Offensive, pp. 494-495. USSBS, Overall Report, pp. 44. Adair, P., Hitler’s greatest defeat : the Collapse of Army Group Centre (London, 1996). Beck, E., Under the Bombs: the German Home Front, 1942-45 (Kentucky, 1986). Bekker, C., The Luftwaffe war diaries (London, 1967). British Intelligence Objective Sub-Committee (BIOS), Iron and Steel Works in Germany, (London, 1946). German Crude Oil Industry (London, 1946). British Intelligence Objective Sub-Committee(BIOS), The German Machine Tools Industry (London, 1947). Weltkrieg, vol. 7 (Stuttgart, 2001). History Review (2010), pp. 107-136. Budrass, L., Flugzeugindustrie und Luftrüstung in Deutschland, 1918-1945 (Düsseldorf,1998). Eichholtz, D., Geschichte der deutschen Kriegswirtschaft, vol. 2: 1941–1943 (Berlin, 1985). Galland, A., The First and the Last (London, 1955). Groehler, O., Bombenkrieg gegen Deutschland (Berlin, 1990). Hampe, E., Der Zivile Luftschutz im Zweiten Weltkrieg (Frankfurt, 1963). Harrison, M., The Economics of World War II: an overview, in The Economics of World War II (Cambridge, 2000). Harris, A. T., Bomber offensive (London,1947). Kroener, B.R., ,,Menschenbewirtschaftung“, Bevölkerungsverteilung und Personelle Rüstung in der Zweiten Kriegshälfte (1942-1944), in Das Deutsche Reich und der Zweite Weltkrieg, vol. 5/2, (Stuttgart, 1999). Levine, A. J., The strategic bombing of Germany, 1940-1945, (New York, 1992). McFarland, S.E., America’s Pursuit of Precision Bombing, 1910-1945, (Washington, 1995). Mierzejewski, Alfred C, The collapse of the German war economy, 1944-1945 (North Carolina, 1988). Milward, Alan S., The German economy at war (London, 1965). der Zweite Weltkrieg, vol. 5/1 (Stuttgart, 1998). Murray, W., Luftwaffe (Baltimore, 1985). Overy, R., The Air War- 1939-1945 (London, 1980). Overy, R., Why the Allies Won? (London, 1996). Overy, R., War and Economy in the Third Reich (Oxford, 1994). of Economic History (2010), pp. 433-468. Vierteljahrschrift für Sozial- und Wirtschaftsgeschichte (2006), pp. 172-196. Speer, A., Inside the Third Reich: memoirs (London,1970). Speer, A., Spandau : the secret diaries (London, 1976). Spaatz, Carl, A., Strategic Air Power: Fulfillment of a Concept (London, 1947). Stevenson, D., 1914-1918 : the history of the First World War (London, 2004). Stokes, R., The Oil Industry in Nazi Germany, The Business History Review, (1985), pp. 254-277. Tooze, A., Wages of Destruction: The Making and Breaking of the Nazi Economy (London, 2006). USSBS, Area Studies Division Report, European Report No, 3 (New York, 1976). USSBS, Interview with Adolf Galland, Interview No. 34 (Washington, 1945). USSBS, Interview with Herman Goering, Interview No. 56 (Washington, 1945). USSBS, Oil Division, Final Report, European Report No.109 (New York, 1976). USSBS, Summary Report, European War (New York, 1976). Vogel, D., Deutsche Und Alliierte Kriegführung Im Westen, in Das Deutsche Reich und der Zweite Weltkrieg, vol. Wagenführ, R., Die deutsche Industrie im Kriege, 1939-1945 (Berlin, 1954). Webster, C. and Noble Frankland, The Strategic Air Offensive Against Germany: 1939-1945, vol. 4 (London, 1961). Wieviorka, O., Normandy : the landings to the liberation of Paris (Cambridge, 2008). STRATEGIC AIR POWER: FULFILLMENT OF A CONCEPT.